Synopsis: It's 1990. Apartheid is crumbling, Nelson Mandela has just been released from prison and thirteen-year-old Spud Milton is about to start his first year at an elite boys-only boarding school. Cursed with embarrassingly dysfunctional parents, a nutty granny and a dormitory full of strange characters, Spud has his hands full trying to adapt to his new home. With only his wits and his diary, he takes readers on a rowdy boarding school romp full of illegal midnight swims, catastrophic cricket matches, ghostbusting escapades, girls and disastrous holidays.South African comedian John van de Ruit invites the reader into the mind of a young boy whose eyes are being opened to love, friendship and complete insanity! Had you been watching me while I was reading this book, you would have seen plenty of expressions sweep across my face. Mostly it involved me grinning, giggling, or laughing, but by the end there was probably also a look of surprise and glazed over eyes. While I have no experience with boarding schools, I do have experience with all boys schools (woe me! ), and Spud embodied everything that happens to a group of testosterone-charged fourteen year olds! Written in diary form, Spud is personal, easily relatable and honestly very amusing. Spud‘s recollections of characters had me in hysterics at the sheer craziness of it all. Through and through, Spud is one of those feel-good novels. The characters are absolutely hilarious. Everything from The Guv, a crazy, drunk John Keating-esque English teacher (which the film adaptation so perfectly casts as John Cleese!) who provides plenty of comic relief, to Spud’s relationship problems, where at one point he three-times on his girlfriend- Spud has more than enough wackyness! 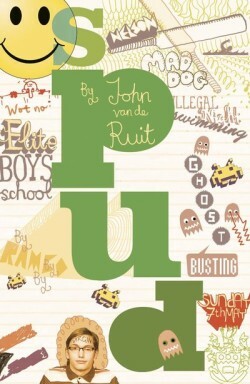 With references to plenty of coming-of-age classics including Adrian Mole (of which Spud is essentially a South African take of) to the 80s film classic The Dead Poets Society, Spud manages to be humorous but serious at the same time- much like Adrian Mole crossed with The Perks of Being a Wallflower. As with all books intended to be funny, it won’t appeal to everyone, but if you are into Adrian Mole you’ll definitely love this. SpudWacky boarding school? Check. Teenage guys? Check. Girl problems? Check. John ‘Spud’ Milton has won a scholarship at a prestigious all-boys boarding school. It’s not easy, particularly when you have a soprano voice and a small body. But that doesn’t get in the way of Spud. He makes new friends, gets his first girlfriend, and wonders why he is the only sane person he knows. A year of hilarity ensues…Had you been watching me while I was reading this book, you would have seen plenty of expressions sweep across my face. Mostly it involved me grinning, giggling, or laughing, but by the end there was probably also a look of surprise and glazed over eyes.While I have no experience with boarding schools, I do have experience with all boys schools (woe me! ), and Spud embodied everything that happens to a group of testosterone-charged fourteen year olds! Written in diary form, Spud is personal, easily relatable and honestly very amusing. Spud‘s recollections of characters had me in hysterics at the sheer craziness of it all. Through and through, Spud is one of those feel-good novels. With references to plenty of coming-of-age classics including Adrian Mole (of which Spud is a South African take on) to the 80s film clasic The Dead Poets Society, Spud manages to be humurous but serious at the same time- much like Adrian Mole crossed with The Perks of Being a Wallflower. As with all books intended to be funny, it won’t appeal to everyone, but if you are into Adrian Mole you’ll definitely love this. What did you think about Spud? I keep seeing this one about and thinking it sounds good… I think I might have to go add it to my wishlist now.. Thanks! It’s awesome! The characters are really hilarious!